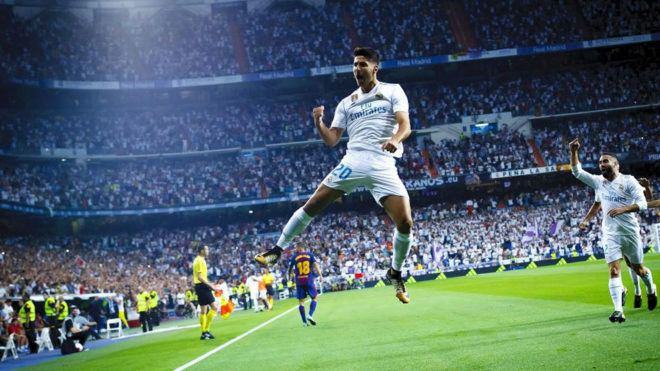 Marco Asensio climbing the sky! Footballers don’t visit bars, at least not the bars where they are judged and scrutinised every week. If they were to walk into a bar and to lean against the bartop then the first regular would explain to Casemiro how to stop Messi, instruct Lucas Vazquez how to cross and give Karim Benzema a class in how to shoot. But they wouldn’t tell Marco Asensio anything. Instead, they would ask Asensio, who is a legend in this bar, to tell them how he does it. “No, no, please teach me,” they’d say. They would ask him how he sees angles so clearly, how he is able to keep the ball so stuck to his foot and how he does this, that and the next thing. That’s because Asensio is able to open mouths, from which no words are uttered, except for a questions of disbelief. So Zidane was right when he said that something is going on. It’s called Asensio. It’s called football. Real Madrid are enjoying the ball, possession and good play, having robbed Barcelona of their identity, wearing the smile of players who could have chosen either of the teams, but who decided to wear white. That football has seen Zidane win seven titles with Real Madrid, who have claimed three of the past four Champions Leagues and who threaten to dominate for a long time. Not too long ago in terms of time, but very far away in terms of feeling, this club looked on at this kind of football that they now play, drawing all looks like a loaded gun. This Real Madrid that dominates the ball is reflective of what the coach did in his own playing days on the same pitch. Zidane has understood that the ball is a treasure and has put his best watchmen around it, the best at treating and protection this bounty. Neither Lionel Messi, who left the Estadio Santiago Bernabeu depressed, nor the home fans could get Asensio out of their view and their thoughts last night. These types don’t understand patience. Back in the day, nobody told Raul to expect to enter the lineup bit by bit and to be patient, as the fire in his eyes meant nobody could talk to him about something like that. In Asensio’s eyes, he has that same look.